SpaceX successfully relands a rocket booster after a launch. A time exposure shows the launch of the Falcon 9 rocket (bright arc curving left), the first stage re-entry burn (top center), and landing burn (bottom right) of the booster. Monday night—Dec. 22 at 01:49 UTC (Dec. 21 at 8:49 p.m. Eastern U.S. time)—space history was made. For the first time the first stage of a rocket came back from helping boost a payload to orbit and landed vertically back at the launch site. WOW. I watched this on the SpaceX live feed, and my heart was pounding like a timpani (hearing hundreds of SpaceX employees cheering wildly only added to the suspense). By landing the first stage of the Falcon 9 rocket successfully, SpaceX can refurbish it and prepare it for another launch, saving a lot of money on launch costs. One of the major goals CEO Elon Musk had for SpaceX was to lower launch costs, making it easier to get into space. On Monday, that goal was achieved. Even sweeter: This was the first Falcon 9 flight after one in June which failed catastrophically, with the entire payload (supplies for the space station) lost. OK, let me back up a bit. Monday night’s launch had the primary goal of placing 11 ORBCOMM satellites into orbit. The launch was originally set for Sunday, but Musk delayed it a day because the weather looked more favorable Monday night to reland the booster. Liftoff was right on time, 20:33 Eastern time (01:33 UTC). The first stage burn went normally and separated cleanly from the upper stage. While the upper stage continues on to carry the satellites into orbit, the first stage—which saved a little bit of fuel from the launch—flipped around and performed a burn to slow down. Without the upper stage, and minus most of the fuel it had at liftoff, it weighed only a fraction of its launch weight, so it didn’t take nearly as much fuel to slow down and reverse course to head back to Cape Canaveral. Cold jets oriented it correctly, and the engine reignited to begin to slow its descent. Four huge landing struts deployed, then, at T+9:44, the moment of truth: It set down safely at Landing Zone 1, the landing pad that was once a launch site of its own in Florida. Moments after touching down, the Falcon 9 first stage booster stands vertically at Landing Zone 1. Minutes later, the 11 ORBCOMM satellites were successfully deployed into orbit, and both the primary and secondary goals of the launch were achieved—a complete success. Incidentally, the second stage saved a bit of fuel as well. It was set to perform a burn to de-orbit itself and will burn up over the Indian Ocean to prevent it from becoming just another piece of space junk to deal with in orbit. When I hear about that I’ll update this post. Update, Dec 22, 2015, at 04:32 UTC: I have word that the de-orbit burn was successful. 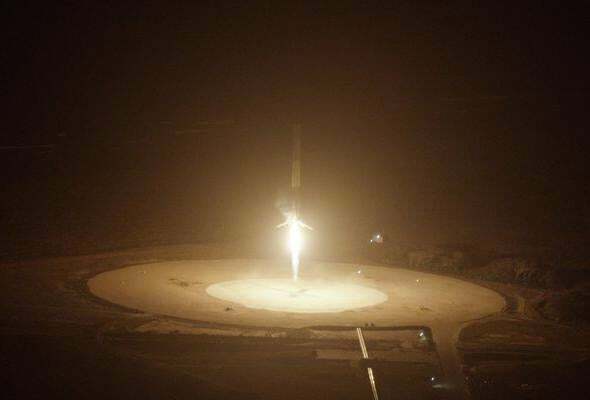 Also, SpaceX just posted this photo below of the booster landing, and yegads. The Falcon 9 booster moments before touching down safely. Let me put this in some perspective. 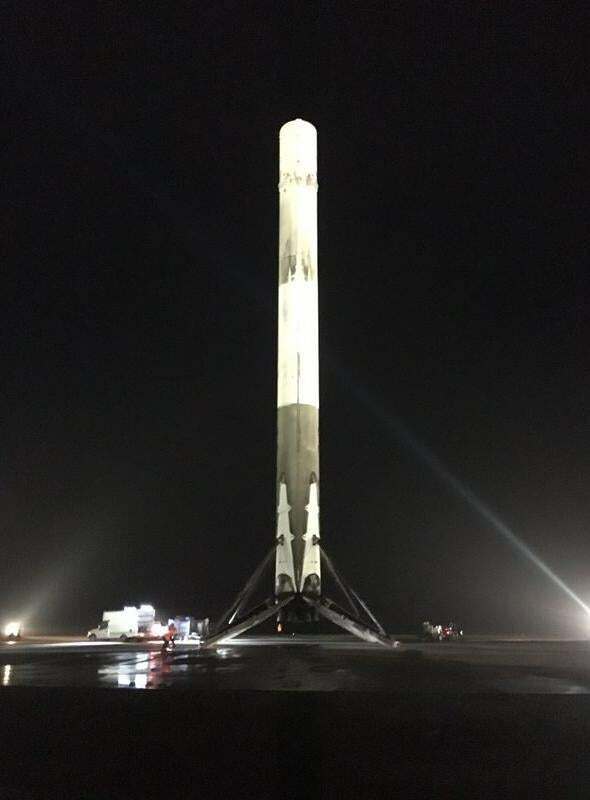 SpaceX has been testing vertical landings for several years’ time with its Grasshopper rocket series, which reached a maximum height of about 1 kilometer (0.6 miles) off the ground. Then, in November 2015, Jeff Bezos’ Blue Origin rocket company successfully sent its New Shepard rocket into space (past the agreed-upon 100-km-high definition of space) and landed it again vertically back at the launch site, the first time that had ever been done. That’s nice, but also a little unfair. He specifically called the booster “suborbital,” equating it to the New Shepard. However what SpaceX did was far more technically difficult. The New Shepard went straight up and down, with no sideways velocity. The Falcon 9 first stage was moving eastward very rapidly, about 6,000 kph (3,600 mph). It had to slow, come back west, and then land. And mind you, it also successfully boosted the second stage with the payload of 11 satellites as well. 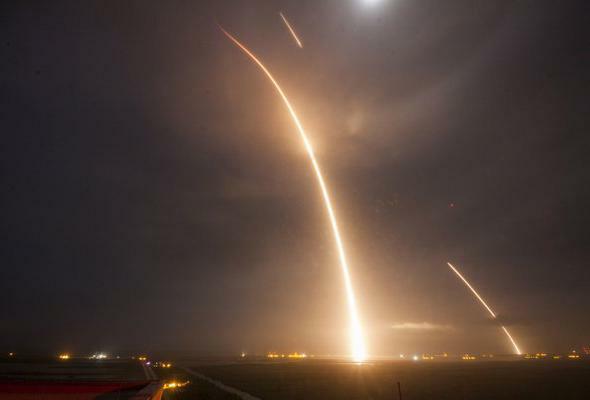 What Blue Origin did was fantastic, but nothing like what happened Monday night with SpaceX. I’ll note that after the New Shepard flight, Bezos and Musk exchanged a series of snarky tweets that were funny but appeared to have more than a bit of competition fueling them as well. So, what’s next? The Falcon 9 first stage will now be thoroughly checked to see what damage it took and what it will take to clean it up and reuse it. Eventually, this will be a less expensive and faster process than building one from scratch. So in a sense, this test isn’t over: Once a booster is reused, then it will show that the next step in spaceflight has been truly achieved (much like, in a historical sense, the second flight of the Space Shuttle was just as important as the first). Nothing is ever routine when it comes to space, so while this was a big step, many more lie ahead. SpaceX has more Falcon 9 launches (and booster landings) scheduled, and will hopefully test its massive Falcon Heavy next year; this is essentially three Falcon 9s strapped together and will have a higher lift capacity than any other rocket on Earth. It’s designed from the ground up to carry humans into space. It won’t be human-rated for some time, and in the meantime SpaceX has an order from NASA to send a crew of astronauts to the International Space Station in 2017. Boeing has two orders for crewed launches, using its new CST-100 capsule. It’s unclear which will launch first. Either way, this is all great news. Two companies are competing to make access to space less expensive and more reliable, and a third, Blue Origin, is making big strides in crewed suborbital launches. It’s been a while—July 21, 2011—since an American rocket brought humans to space, but the time is soon coming when we’ll be doing it again. Congratulations to everyone at SpaceX. You earned this. Postscript: I wrote about Musk, SpaceX, and the goal of putting humans on Mars after a trip to the SpaceX factory earlier this year. That will put this launch into perspective as well. Correction, Dec. 22, 2015, at 04:45 UTC: I originally misstated that the landing was on Dec. 21 at 01:49 UTC, but that was a typo. It was on Dec. 22 at that time, -5 hours for Eastern, so Dec. 21 for U.S. folks.